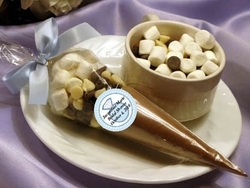 Hot cocoa cone favors make a fantastic Bridal Shower Favor! Deliciously rich and creamy, indulge your guests with a welcome treat of hot cocoa layered with marshmallows and dark and white chocolate chip toppings! Each time your guests take a sip of this delightful treat, they will be filled with the warmest memories of your special day. Once only a traditional winter beverage, our favors are designed to be enjoyed year round and celebrate any special event. 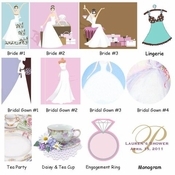 Best of all, they're personalized with bride's name and shower date. Satin bow included. Measures approximately 10 inches high by 3 inches wide and makes enough servings for one!